I am not a climate change scientist, but I have come to understand that I am a climate change victim. Our daughter took the lead investigating destructive lightning in Maine. She found that the NASA Goddard Institute estimates a 5-6% change in global lightning frequencies for every 1 degree Celsius global warming. The Earth has already warmed .8 degrees Celsius since 1802 and isexpected to warm another 1.1-6.4 degrees by the end of the century. 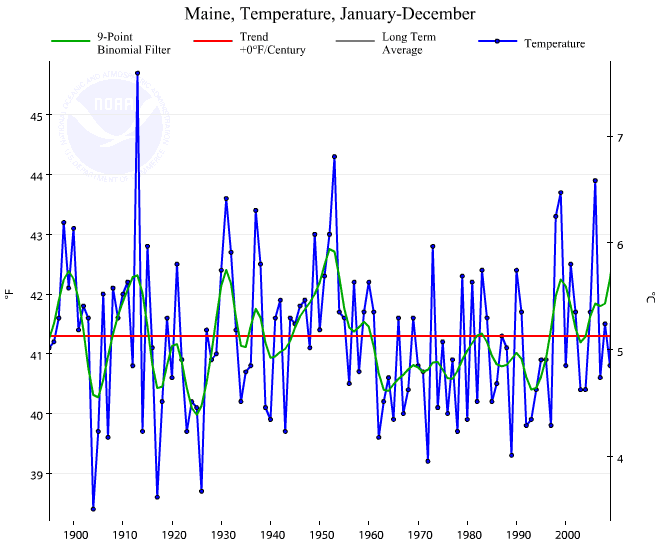 Maine's temperatures rose 1.9 degrees Celsius in the last century and another 2.24 degree rise is projected by 2104. I learned from our insurance company that while the typical thunderstorm produces around 100 lightning strikes, there were 217 strikes around our house that night. I was shocked to discover that when it comes to increased lightning frequency and destructiveness, a NASA study concluded that eastern areas of North America like Maine are especially vulnerable. Scientists confirm a 10% increase in the incidence of extreme weather events in our region since 1949. This is one of those paragraphs that is so bad, I put off writing about it because I could write a book about all the errors. 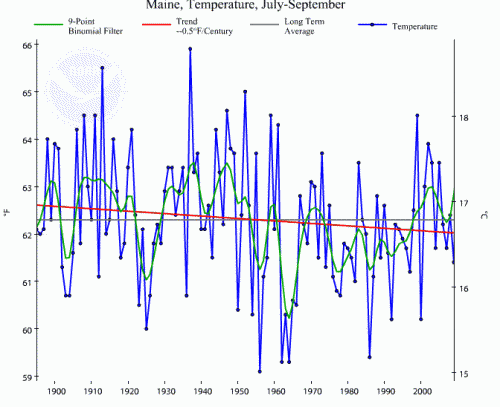 The world has warmed about 0.8C over the last century or two. Congrats. Infinite monkeys and Shakespeare and all that. We could argue the forecasts, but they are irrelevant to this discussion as we are talking about current weather which cannot be influenced by future warming. Oops, not a lot of warming here, and certainly not 1.9C. In fact, there has not even been a single year that has been 1.9C above the average for the century since the early 1900s. And 2009 was a below average year. Well, she said it was in summer. That's when we get the majority of thunderstorms. Maybe it is just summer warming? The NOAA does not have a way to get just summer, but I can run average temperatures for July-September of each year, which matches summer within about 8 days. Whoa! What's this? A 0.3-0.4C drop in the last 100 years. And summer of 2009 (the last data point) was well below average. Wow, I guess cooling causes lightning. We better do something about that cooling, and fast! Or else buy this professor some lightning rods. What is this, the climate version of the Lake Wobegone Effect? If all our storms are not below average, then that is proof of climate change. Is this really how a Harvard professor does statistical analysis? She can just look at a sample and the mean and determine from that one sample that the mean is shifting? 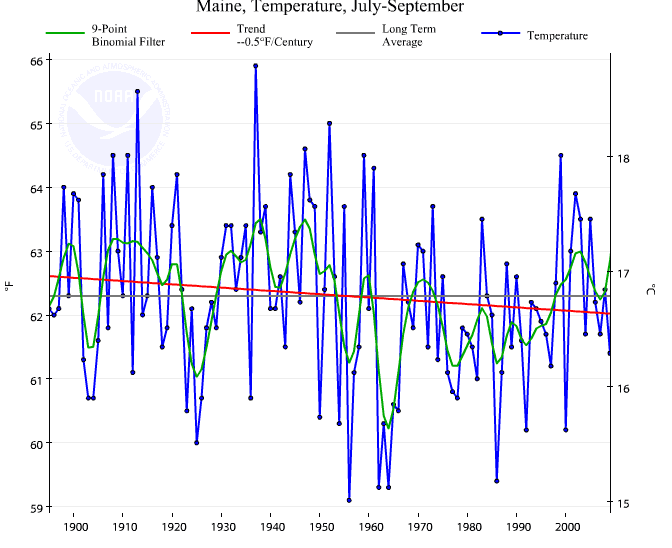 Finally, she goes on to say that extreme weather in her area is up 10% from some source called the Gulf of Maine Council on Marine Environment. Well, of course, you can't find that fact anywhere on the source she links. And besides, even if Maine extreme weather is up, it can't be because of warming because Maine seems to be cooling. Immediately after the near-fatal attack on Arbogast, another attack severed the leg of a New Yorker vacationing in The Bahamas, while a third attack on a surfer occurred about a week later on July 15, six miles from the spot where Arbogast was bitten. In the following weeks, Abrogast's spectacular rescue and survival received extensive coverage in the 24-hour news cycle, which was renewed (and then redoubled) with each subsequent report of a shark incident. The media fixation continued story with a cover story in the July 30th issue of Time magazine. In terms of absolute minutes of television coverage on the three major broadcast networks—ABC, CBS, and NBC—shark attacks were 2001's third "most important" news story prior toSeptember 11, behind the western United States forest fires, and the political scandal resulting from the Chandra Levy missing persons case. However, the comparatively higher shock value of shark attacks left a lasting impression on the public. According to the International Shark Attack File, there were 76 shark attacks that occurred in 2001, lower than the 85 attacks documented in 2000; furthermore, although 5 people were killed in attacks in 2001, this was less than the 12 deaths caused by shark attacks the previous year. A trend in news coverage <> a trend in the underlying frequency. If these were correlated, gas prices would only go up and would never come down.